A car (also called an automobile) is a vehicle used to transport passengers. Cars usually have four wheels and an internal combustion engine. Another name is automobile from Greek "auto" and French "mobile". This name means "self-moving", as cars do not need horses or other external sources of power to move. Some small "city" cars carry only two to four people, and have very little luggage space. Other types are able to carry many passengers or heavy loads. For example, family station wagons or estate cars carry from 5 to 9 people, or fewer people with lots of luggage. A van or pickup truck is a car-like vehicle made for carrying medium sized loads; for example, goods for delivery or plumber's and builder's tools and materials. Heavy lorries are used to carry deliveries and heavy loads. In order for a car to work, it must have fuel. The most common fuel is petrol, which is called gasoline in America. Some cars burn diesel or ethanol. A few can run on several different fuels. Alternative fuel vehicles use less common fuels like natural gas, wood gas or electricity. Some car-making companies have also tried building vehicles that run using hydrogen fuel cells, which do not give out any polluting exhaust gases (but making hydrogen may at first still need electricity made by a power plant that burns similar fossil fuels). In some countries, such as Brazil and Sweden, a mixture of ethanol and petrol, called gasohol in Brazil and E-85 in Sweden, is used as automobile fuel. The earliest automobiles recorded were actually steam engines attached to wagons in the late 18th century. The steam engines were heavy and therefore the wagon was slow and hard to control. Improved steam cars beccommon late in the 19th century. Some cars in the early 20th century were powered by electricity. They were slow and heavy and went out of use until the idea was revived late in the century. 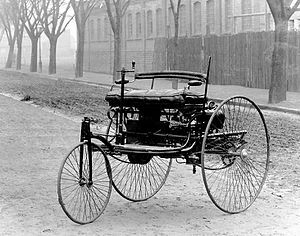 Although many people tried to make a good car that would work well and sell well, people say that Karl Benz invented the modern automobile. He used a four-stroke type of internal combustion engine to power his "Motorwagen". He began to sell his production vehicles in 1888. 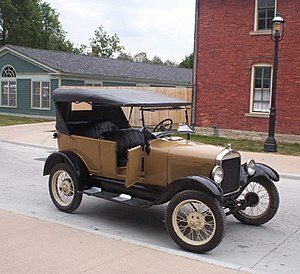 In North America, the first modern car was made by the Duryea Brothers in Springfield, Massachusetts. The Duryea Brothers' car also won the first-ever car race in 1895, competing against cars made by Benz. The race was in Chicago, Illinois, and 53 miles long. Duryea then began production of the first commercial automobiles in 1896. That year they made 13 cars by hand in Springfield, Massachusetts. Benz may have invented the first modern car, and Duryea the first commercial car, but Henry Ford sold the most cars to the most people. In 1910 he began making and selling his Model T, which was a huge success. Many people could afford this car, not just the rich, because Ford used mass production. This meant he made a great many Model Ts in a short time in a factory. People say that the Model T is the car that "put America on wheels". The Model T was the most popular car of the time because it was cheap but it was still a good quality car that everyone could own. Cars are faster than walking or riding a bike if you are going a long way, can carry more than one person, and a large amount of luggage. Depending on local public transport quality, they can also be faster and far more convenient than using buses, bicycles or trains, and can often go where public transport cannot. 4-wheel drive "off road" vehicles are particularly good at reaching places difficult for any other wheeled transport due to bad roads or harsh terrain, though they cost more and burn more fuel. Buying and running a car needs a lot of money, even more for a good quality one that is not too old. There are a lot of things to pay for - the car itself, fuel, parts (for example, tires/tyres), maintenance, repairs, insurance to cover the cost of crashes or theft, parking charges and toll roads and any tax or licensing fees charged by government. If two cars crash they can hurt the people inside or around them. When too many cars try to go the same way, traffic congestion slows them all. They can cause air pollution if too many are used in a small area like a city, and the combined pollution of the world's cars is thought to be partly to blame for climate change. Many places where people live close together have public transportation (or mass transit) such as buses, trains, trams and subways. These can help people go more quickly and cheaply than by car when traffic jams are a problem. Some of these problems can be fixed, for example, by carpooling, which is putting many people together in one car. This page was last changed on 21 November 2014, at 11:43.